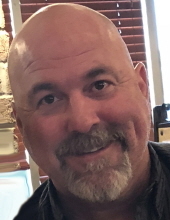 Mr. Barry Royal Foster, age 44 of Wilkesboro passed away Sunday, November 25, 2018 at his home. Funeral services will be held 2:00 PM Friday, November 30, 2018 at Mt. Pleasant Baptist Church Reach Center with Rev. Kevin Brown and Rev. Joey Moore officiating with Military Honors by Veterans of Foreign Wars Post 1142. Burial will be in Severt Cemetery in Ashe County. The family will receive friends at Mt. Pleasant Baptist Church Reach Center from 11:30 AM until 1:30 PM prior to the service. Mr. Foster was born January 2, 1974 in Wilkes County to Boyd and Judy Wyatt Foster. He was a franchise owner for Window World, Inc. He served in the United States Army. He is survived by his mother; Judy Wyatt Foster of North Wilkesboro, Kim Foster of Louisville, KY, step-son; Joseph “Daniel” Holbrook of Winston-Salem, a step-daughter; Brytanie Talty and husband Shane of New York, NY and two brothers; Gary Foster and wife Margo of Wilkesboro, Larry Foster and wife Mary of Traphill. In lieu of flowers memorials may be made to; Window World Cares/St. Jude Children’s Research Hospital, 118 Shaver St., North Wilkesboro, NC 28659. To send flowers or a remembrance gift to the family of Barry Royal Foster, please visit our Tribute Store. "Email Address" would like to share the life celebration of Barry Royal Foster. Click on the "link" to go to share a favorite memory or leave a condolence message for the family.